Alright! Terrible Job! That's what you were going for, right? The premise is the only thing this show has going for it, and it doesn't hold up long; to that point, the plot itself is nothing more than an establishment of the premise followed by a stream of boring vignettes. The artwork is interesting enough to warrant a moment's attention, but the animation doesn't take it anywhere. Any studio in Japan can animate characters talking while standing still from dull, flat camera perspectives. Unless those are meant as a meta-criticism of the flat, annoying characters? In which case, I would suggest writing more interesting characters and better jokes instead of doing a bad job and then poking fun at it by doing an even worse job. More likely, though, the team behind this show just did a bad job. Really bad job all around, Polar Bear Café! Congratulations? Worth a try no matter who you are. This show won't change your world views, but it's undoubtedly one of the best anime of the year. It's basically a comedy slice-of-life about a panda (named Panda) who works part time at the zoo and his friends at the Polar Bear cafe (run by Polar Bear the polar bear. Getting the naming scheme yet?). It's completely family friendly. You could suggest this to anyone, no matter their age, and they could enjoy it. The characters have very distinct personalities, and they're fun to watch. There's not a lot to animate, but the animation style of the animals is very realistic, life like, well done, and pleasant to watch. Without a doubt, one of the main reasons to watch this is the cute animals doing cute things. It causes your brain to melt, like watching a puppy playing or a bunny scratching its nose. It's just plain adorable. But the cuteness is just icing on the cake. Polar Bear Cafe's greatest asset is its comedy. The jokes are original and varied. Whether it's Polar Bear's puns and general trolling, Penguin's bad luck with female penguins, Panda's narcissism, the visual jokes, or the more subtle and mature ones, I guarantee you will find something to laugh at. Give this a try, no matter who you are. It's great coming home from a long day, sitting down and cheering up to an episode of Polar Bear Cafe. 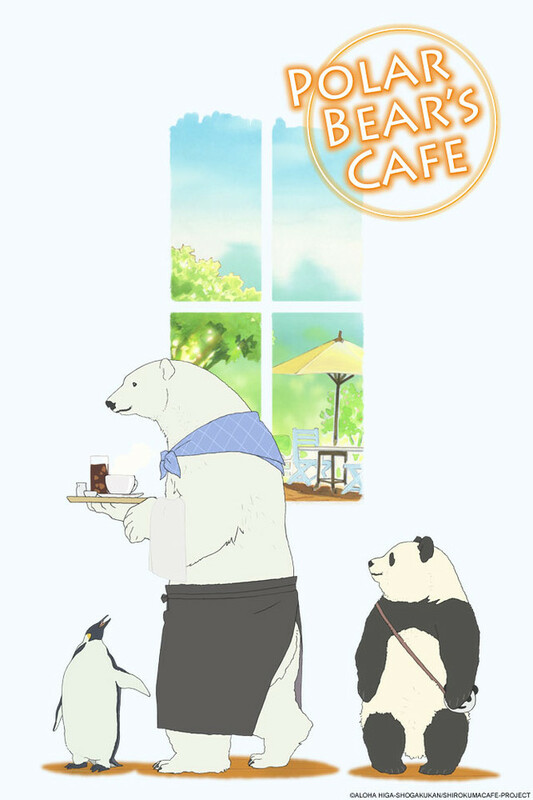 Polar bear Cafe is a very funny and original anime. It is about a lazy panda bear who works at a zoo part time and his friends, Polar bear who owns the cafe and Penguin who is a regular at the cafe. Each episode is different, some are more about Panda and some are about all of the animals. It is an excellent anime and I hope it has many more episodes. A great anime if you're a animal lover like myself! You'll enjoy every moment and each character actually has a role and talks! Originally, I wasn't going to watch it because I'm very supicious of any show that has talking animals and usually, they end up putting each indivisually speices as stupid as rumors say. But this has an exception! Each ceature has it's own personality with those of it's species! If you get the chance, watch the show, for Panda's sake! Can I go to Polar Bear Cafe? This anime is so cute! I love all the characters. Really was not sure what to make of everything at first with talking animals mixed in with humans. It works out in a nice original sort of style. I loved finding little cafe's like Polar Bear runs while I lived over in Japan and I would have loved to have found a place like his while I lived there. Character design is really interesting too. Panda has no obvious eyes and neither does Penguin, but you don't need them. They are so cute and expressive without that I think is shows some serious skill on the side of the animators. Really if you like cute and slice of life, you are going to adore this series. Killer cuteness! So Effin Cute It Should Be Illegal! This anime is the cutest thing I have ever watched Specifically episode 9. I dont know if it would even be possible to be mad while watching this. And its a nice break from all the natuto and bleach like shows out there. This is a cute little anime when you're in the mood for something happy and sweet! A GREAT mood picker-upper after a stressful day for sure. A little predictable and juvenile, but what else would you expect from an anime featuring a panda, polar bear, penguin, and others as main characters? We've all seen an anime that's stuffed full of cliches. The abused protaganist becomes a great hero, the guy returning home ends up being the moron guy in a harem of girls, and of course the popular ones with demons, explosions and unspoken love interests. This isn't to say that I'm not one for a good anime stereotype, but sometimes it's nice to take a break. Polar Bear's Cafe is a funny and lighthearted slice of life following a little panda simply named Panda and his day to day activities. From his job at the zoo, to enjoying a plate of bamboo at his friend Polar Bear's cafe. This anime is full of puns and childish humor. It's a nice slow and easy anime to watch when you aren't feeling up to watching the explosions and random sword fights that tend to litter popular anime. The characters are quirky and charming, the music is fun, and it's a cute anime to watch. Polar Bear’s café revolves around a Canadian white bear that quits his boring job and starts a cafeteria near a zoo.